Non-Smoking. 3 Bedroom 2 Bath. King bed in the master with walk in closet, queen bed in the second bedroom, twins in the third bedroom. 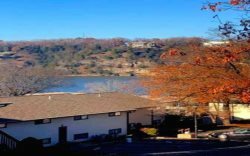 Regatta Bay is located in the Four Seasons area on Horseshoe Bend Parkway, MM 12, just one mile past the entrance to Lodge of Four Seasons. .
12' x 30' boat slip available for an additional fee. The beautiful park-like Regatta Bay complex has large open areas in a wooded setting, two tennis courts, a lakefront pool, and another pool adjacent to the clubhouse overlooking the Lake. A pavilion and picnic area are available for guest use.